ST. PETERSBURG, Fla. — Thanks to a run of strong starting pitching, the constant shuffling of the their bullpen due to injury and ineffectiveness has not had a detrimental effect on the Mariners … yet. But at some point, the accumulation of it all could loom costly. The Mariners lost two more relievers with injuries on Friday afternoon, placing right-handers Juan Nicasio (right knee effusion) and Dan Altavilla (right ulnar collateral ligament strain) on the 10-day disabled list. 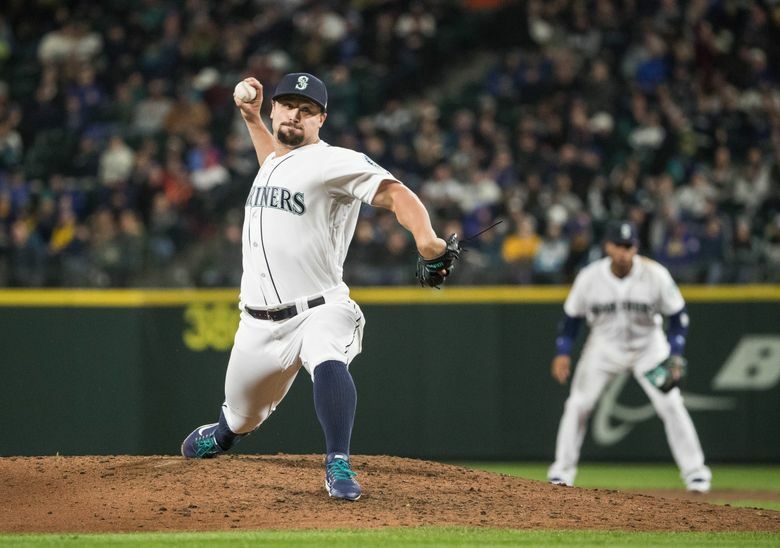 Seattle recalled first baseman/designated hitter Daniel Vogelbach and selected the minor league contract of reliever Mike Morin to fill their spots. 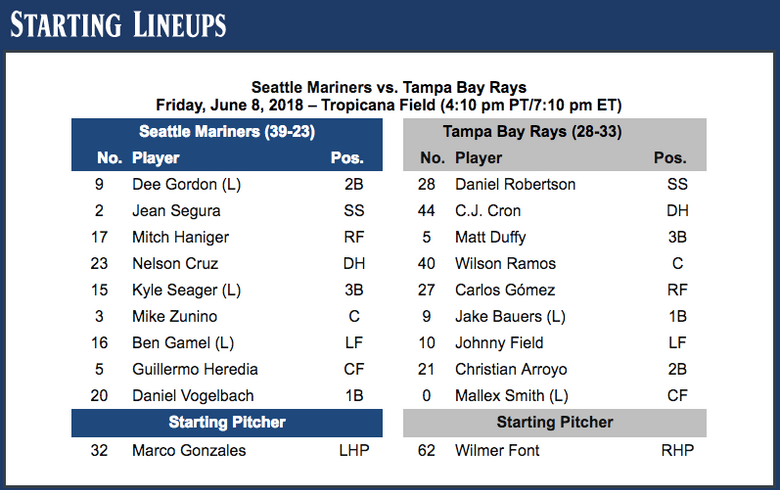 Vogelbach was inserted into the starting lineup at first base on Friday night in place of Ryon Healy. Nicasio, 31, is 1-3 with a 5.34 ERA and an American League-leading 14 holds. He is fourth among all MLB relievers with an 18.50 strikeout to walk ratio (37 strikeouts, 2 walks). His knee issue isn’t thought to be serious. Effusion is just a fancier word for swelling in the knee. It’s something that has been bothering him for a while and continued to get worse with each day of usage and working out. Nicasio admitted that he felt it in his recent outing in Houston where he struggled with his fastball command. Because it’s on his right leg, the knee causes his pain when he pushes off the rubber in his delivery. Nicasio will still be able to play catch and keep his arm in shape. But he won’t be allowed to run. Altavilla, 25, is making a second trip to the disabled list this season. His previous stint was for inflammation in his acromio-clavicular joint in his shoulder. In 22 relief appearances with the Mariners this season, he is 3-2 with five holds and a 2.61 ERA (6 ER, 20.2 IP). He felt some tightness and soreness in his forearm while throwing before Thursday’s game. Any time there is an issue with the UCL, it’s a concern that Tommy John surgery (Ulnar Collateral Ligament replacement) would be needed. Altavilla underwent a MRI on Friday in St. Petersburg and was scheduled to fly back to Seattle on Friday night. He’ll meet with team doctors to go over the results. “We are hoping we are out ahead of it and it’s not too serious,” Servais said. Why not bring two pitchers back instead of just one? Morin, 27, was claimed off waivers in the offseason from the Royals. He has appeared in 20 games for Class AAA Tacoma, posting a 2-1 record with three saves and a 3.24 ERA. Servais and general manager Jerry Dipoto were familiar with Morin from their days in the Angels organization. Morin pitched in parts of four seasons (2014-17) at the big league level with the Angels. He has 183 MLB appearances, posting a 10-8 record with a save and a career 4.61 ERA. This is Vogelbach’s third time up with the Mariners this season. He’s hitting .200 (12 for 60) with two doubles, two homers and five RBI in 22 games with Seattle. In 32 games with the Rainiers this season, he’s hitting .304 (34 for 112) with 9 doubles, 10 home runs, 24 RBI and 28 walks with only 18 strikeouts. He has on-base percentage of .444 and is slugging .652 (1.095 OPS) . Vogelbach’s stay with the Mariners could be short. Vincent is nearing a return after going on the disabled list with a groin strain. He and catcher Chris Hermann are reporting to Class A Modesto for a rehab assignment this weekend. Vincent is scheduled to pitch on either Saturday or Sunday for one inning. If all goes well, he could be activated for the homestand that begins on Monday. As part of the day’s roster shuffle, the Mariners’ No. 2 prospect — first baseman Evan White — was promoted to Class AAA Tacoma from Class A Modesto. However, Dipoto confirmed the jump to the highest level of the affiliates was just a temporary move for White. With Vogelbach called up and Cameron Perkins on the disabled list, the Rainiers needed a first baseman. So the Mariners decided to let White get a taste of the higher level of competition. White will eventually return to Modesto, but a promotion to Class AA Arkansas after the All-Star break is possible if he continues to play well. White is already a Major League-level defensive player at first base and is one of the best athletes in the organization. He’s hitting .282 with a .758 on-base plus slugging percentage, 10 doubles, three triples, three homers and 24 RBI in 50 games with the Nuts.